The human eye is a wonderful instrument designed to collect visual information. Transitions Drivewear lenses maximise the eye’s natural abilities in different light conditions and various daytime activities. 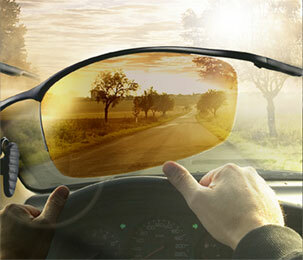 Transitions Drivewear are the ultimate sun lenses for outdoors and daytime driving. These high performance patented polarized photochromic lenses combine two innovative technologies: the advanced photochromic technology of Transitions® and the high efficiency polarization of NuPolar®. Transitions Drivewear are not suitable for night time driving. This dynamic combination means the lens continuously adapts to changing light conditions by reacting to both visible light and UV light. Transitions Drivewear sun lenses provide the ideal lens colour and darkness to suit your current daytime outdoor or driving conditions, while blocking 100% of the sun’s harmful UV rays. Always polarized, Transitions Drivewear polarized lenses incorporate photochromic dyes designed to shift between a lighter and darker density by reacting to changing light conditions. Transitions Drivewear activate behind the car windscreen, which was not previously possible with traditional photochromic technology. In bright sunlight, the lens is exposed to both visible and UV light. The lens changes to a dark brown colour and moves to its darkest state with an 88% tint. This means 88% of the light is blocked and only 12% passes through the lens to your eye providing maximum protection against intense sunlight. The high contrast polarizer inside the lens also provides maximum protection against blinding glare for excellent contrast enhancement and the ultimate in visual comfort. In overcast conditions, the lens lightens to a 65% tint permitting the maximum amount of light to reach your eye providing optimal daytime vision in low light conditions. The lens changes to an olive colour providing much needed high contrast in poor light during the daytime. 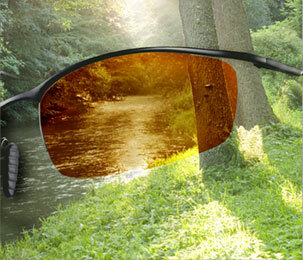 The polarization removes glare that could compromise vision, particularly in inclement weather. Car windscreens block the UV rays that activate and darken standard photochromic molecules. With the breakthrough technology of Transitions Drivewear, the photochromic molecules respond to and darken in visible light. Inside the car the lens changes to a copper colour to remove excess light and provides excellent traffic signal recognition, highlighting reds and greens. The lens darkens to 75% tint to remove excess light. The polarization blocks perilous blinding glare that can dangerously threaten vision while driving during the daytime, such as glare reflected off smooth shiny surfaces, water, roads and wet surfaces. The polarization technology of Transitions Drivewear lenses represents a significant breakthrough in the use of polarization. Typically, efficient polarization by absorption only occurs when large quantities of absorbers are present. But this high efficiency polarization makes the lens very dark. While this is desirable for the times when there is bright sunlight, it does not address lower light conditions, particularly during overcast weather. Transitions Drivewear lenses feature a high efficiency polarizing filter that blocks the bad light (glare) and lets the maximum amount of good light pass through the lens. This high light transmission was only achieved by pushing polarized manufacturing technologies to new levels of exceptional performance. The photochromic properties of Transitions Drivewear lenses offer a significant advancement over conventional photochromics, which respond only to UV light exposure. Car windscreens block UV light, so conventional photochromic lenses do not darken inside the car. Younger Optics teamed up with Transitions Optical to develop special UV and visible light sensitive photochromic dyes. 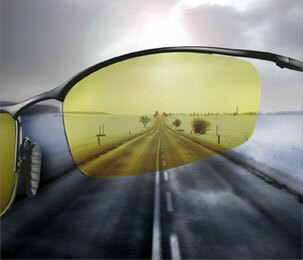 Transitions Drivewear lenses use advances in Transitions photochromic technology and breakthroughs in Younger Optics’ NuPolar polarizing technology to create a unique product. Other attempts have been made to combine polarization and photochromics. These attempts did not succeed because the properties of the lens were not designed specifically to make the two technologies work together in a complimentary and synergistic way. Transitions Drivewear lenses go beyond these initial attempts by using each of these specific technologies in ways that enhance each one’s capabilities. Transitions Drivewear’s combination of technologies is so advanced and novel that several countries have recognised the innovation by granting a patent on the product. Watch the video to find out more about Transitions Drivewear technology.